This story takes place in Pondicherry, India in 1954. Piscine Mortel Patel is a son to a zookeeper, who owns a big zoo in Pondicherry. Piscine, also called Pi, lives with his dad, mom, and his brother. Everything was going well in Pondicherry, until the government was not funding their zoo. Pi’s family was forced to move to Canada, so they took a ship called the Tsitsum. They also took some of their animals from the zoo with them because the animals in India could be sold for more money in North America rather than in India. On their way to Canada, the ship gets wrecked and starts to sink while a huge storm was going on in the night. Pi noticed what was going on and tried to escape. Pi tried to help his mom and dad, but when he reached the staircase that lead to his mom and dad’s room, it was completely flooded. He had to get out by himself. He gets into a lifeboat and escapes from the wreckage. Everybody dies in this wreckage except for Pi and some animals. A zebra, orangutan, hyena, and a tiger named Richard Parker some how survived the wreckage and climbed onto the same lifeboat that Pi was on. The tiger hid under some sheets for some rest, while the hyena, zebra, and orangutan stayed outside with Pi in the boat. Over time the hyena started to feel hungry and ate the orangutan and zebra. Soon Richard Parker got out of the sheets and ate the hyena. Pi scared for his life, started to threaten him by pointing a stick at him. Richard Parker backed away and did not hurt him. Pi came to a conclusion that he had to train him if he wanted to survive in this boat. He used two key components when training the tiger, a stick and a whistle. He also had to fish for Richard Parker, so he would not feel hungry and instead eat Pi. Over time Richard Parker adjusted and both of them lived in harmony. After a month or so, Richard Parker and Pi starts to hallucinate because of lack of food and water. It came to a point where they had to drink urine and ocean water. Finally, after a long perilous trip they found land. Pi walked out on shore and falls after the first few steps. Then Richard Parker comes out. He stumbled a few times and walked. Finally, he reaches the jungle. He paused and then walked into the jungle. After sometime, the natives found Pi and took him to a nearby hospital. In that hospital, he decides to go to Canada and live there like his family wanted to. 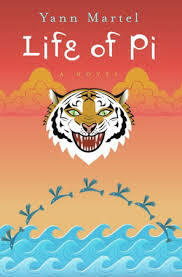 Yann Martel’s finest piece of work, Life of Pi. This book talks about the main character, Pi, going through many hardships just for survival. Yann Martel describes each part of the book with intensifying detail. Literally, there is sometimes where in some chapters, he just talks about how a tiger struggles to get on a boat. When Yann Martel describes something, it feels as if you are standing where Pi is standing; this really caught my attention. The backstory of Pi in the beginning of the book is very interesting because of the main character’s personality. It is also very interesting how he trains a tiger to listen to his commands. One thing that really amazed was how he trained a tiger on a boat. Usually, a person would train a tiger in a circus where you have all the tools to do it, but his tools were very limited. Overall this book is a great manual to train your pet tiger as well as a great book about a boy who survives from great difficulty. This book would probably be in my top ten or even top five in books that I have read. I recommend this book to anybody, it is a book that must be read. 1. Why did Pi’s dad teach Pi and his brother the lesson about wild animals? 1a. He taught them the lesson about wild animals because knowing that one of his children went to confront the most dangerous animal in the zoo, a tiger, he wanted to make sure that they never do it again so nobody is hurt. 2. Why was Pi’s parents reluctant on making Pi baptized? 3. How was Pi named Piscine Mortel Patel? 3a. He was named Piscine because his “Mamaji” thought that Piscine Mortel, a pool in France was the best pool in that time, so he thought that it would be an amazing name. 4. Why did Pi push Richard Parker away from the boat? 4a. He pushed him away from the boat because he realized that if he kept Richard Parker in the boat, he would eat him. 5. Why did Pi’s family decide to move to Canada? 5a. Pi’s decided to move to Canada because the government was not funding the zoo, so afraid that they will run out of business they moved. 6. Why was the tiger called Richard Parker? 6a. The tiger was called Richard Parker because of a small mix up that happened before the construction of the zoo. Pi’s family was supposed to get a panther named Richard Parker, but somehow, somebody messed it up and they got a tiger instead. Without knowledge about what happened they started to call the tiger Richard Parker, and that stuck with him. 7. Why did not Pi want to kill Richard Parker? 7a. He did not want to kill Richard Parker because he did not want to be left with nothing else, but despair which is even worse. 8. What was did Pi mean when he was talking about traffic lights and cars in the middle of the ocean? 8a. He was talking about the different colors of fish, jellyfish, and every other sea creature in the water. 9. What was plan six in operation getting rid of Richard Parker? 9a. Plan six was all about waging war against Richard Parker which did not sound like a great idea. 10. How did the zebra die? 10a. The zebra died because it was weak and most of its organs were pulled out when the hyena attacked. 11. Why was Pi and Richard Parker blind for a few days? 11a. They were blinded for a few days because of the lack of food and water they have been consuming. 12. Who was Pi talking to while he was hallucinating? 12a. He was talking to Richard Parker; he thought that Richard Parker was talking to him. 13. Pi was hallucinating one more time but this time he was thinking about a sweet, what was the sweet? 14. At the end of the story, why did the Japanese reporters not believe him? 14a. The Japanese reporters did not believe him because they wanted to write an amazing story that everyone can believe. If they write a story about a person and a tiger surviving in a shipwreck and living together, they will look like fools. 15. Why did Richard Parker just stare at the jungle when they finally reached land? 15a. He just stared at the jungle because he did not know whether he should ditch his friend, Pi or go back to the jungle.